Yesterday morning I got out of bed at 5:00 a.m. to eat a bowl of cereal and a banana, drink a cup of coffee and a quart of water, and drive down Taft Hill Rd to Devil's Backbone Open Space for this year's edition of the Crazy Legs 10K trail run. Like last year, the weather was beautiful, the trail dry, the greenery very green. During the drive, I saw our Moon appear to go down directly behind Longs Peak. It is, of course, the other way around: the Moon, the horizon, and Longs Peak each move eastward relative to the stars, but the mountain's apparent velocity is 27 times faster. I ran the steep and rocky course in 1:04 (unofficially), one minute faster than last year, and finished in 17th place (up 7 spots). Best of all, I did not fall on the trail's notorious rocks the one time I stumbled. In my race packet, I found this. 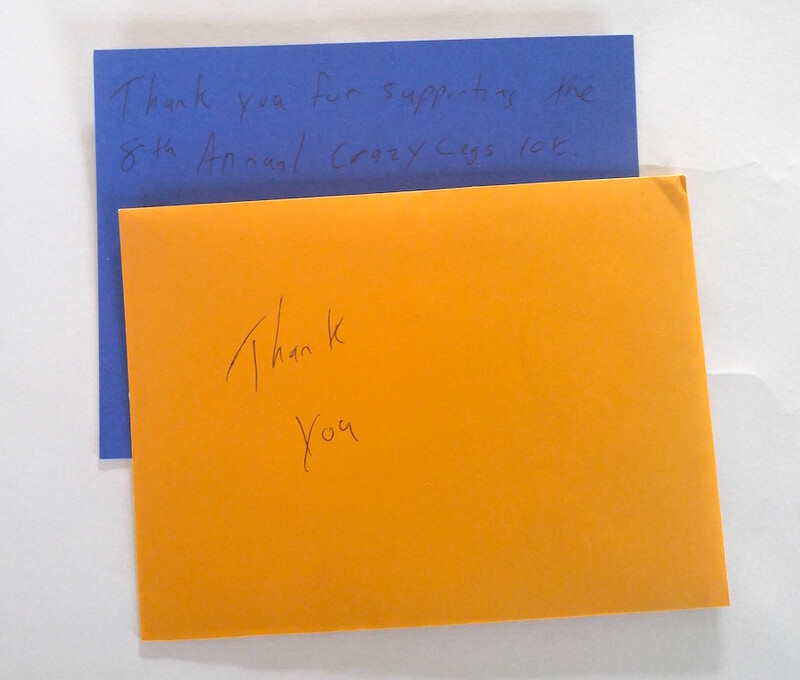 A handwritten thank you note from the organizer to every entrant. A classy detail of a thoroughly classy event.